I have to admit it’s frustrating to receive these kinds of invitations. I am invited to so many trunk shows and fashion shows in New York. Sigh. Would you believe there was a time when both Honolulu newspapers sent their fashion editors to New York for all the shows? Hope Dennis, a former Honolulu Advertiser fashion editor, said in the ’70s the newspaper even sent her to Paris one year. Longggggg gone are those days. But I can lust, can’t I? There’s just something about the color, size, shape and texture of this Anya Hindmarch bag that sings to me. I love this neutral! It would go with so many other neutrals (think navy, yum! ), as well as some of the brights that are out there for spring. I would love to have a pair of shoes in this leather as well…but not matchy-matchy, natch. This entry was posted in Shopping and tagged Anya Hindmarch, Honolulu Advertiser, Hope Dennis, Paula Rath. Bookmark the permalink. 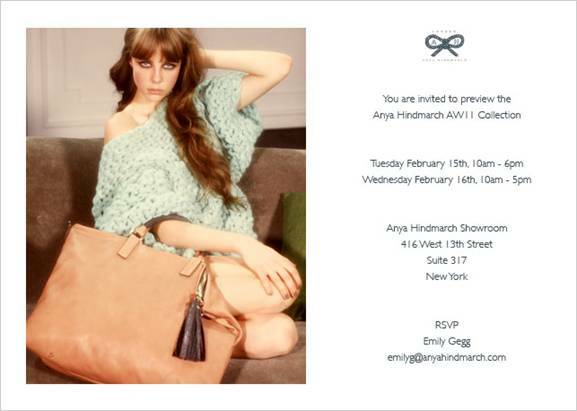 Love Anya Hindmarch designs! Yes, you are right, gone are the days!